Whether you are trying to get into swimming for the first time, or go from “good to great” for your triathlon swimming, working on your swim is a key part of your training plan. Getting your triathlon swim stroke back after a winter of easy pool swims, or creating a good swim stroke if you are new to the sport requires some effort and planning. Many swimmers get comfortable in the pool, and then get into a rut of doing the same workout time after time. Doing so will maintain a certain level of ability, but will not be enough to help you break through the plateaus that set in if you don’t vary your workouts. For a triathlete, varying workouts is about more than just mixing up workout intensity — it includes getting enough open water time in so you have an advantage in the big water too. In a recent conversation with a group of high-level swimmers, the following tips emerged as advice that novices and experts alike can use to revitalize their training. It might sound simple, but so many people jump in the pool without any type of plan or knowledge. Most advanced swimmers have a idea of what they want to do before they get into the pool, and their technique improvement plan will force them to work on things that will help advance their overall ability. If you are at a loss for how to learn the art of open water swimming, consider a book with practical guidance and a variety of training plans to use. We like the Total Immersion approach, which has been used by thousands over swimmers over the years with indisputable results. We also like the idea of working on 1-2 simple things each offseason. As you improve your technique gradually, you will soon be a high-level swimmer by putting it all together. Sometimes the only way to really change, improve, or (if you are a real beginner) learn your swim stroke is to have someone teach you. We have seen many triathletes over the years, and think that investing in a coach can be a great way to accelerate your learning curve. It also allows you to bypass all the bad habits people tend to learn when swimming on their own. You can find a coach at a local fitness club, or through any number of national swim organizations. It doesn’t take much coaching to correction some issues with your technique, and become faster while expending less energy. Much like cycling, there is no substitute for spending time in the pool when you are trying to improve your swim. Speaking of having a plan, be sure that plan causes you to have a wide range of swim workouts. 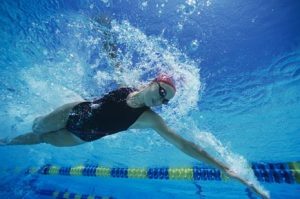 The best swimmers will rotate between sprints, long distance, and technique work, sometimes all in the same workout or sometimes having a day that just focuses on one area. Without variety, you will experience the proverbial “rut”, something that affects swimmers, cyclists, runners, and any other athlete who fails to mix it up. For novices, injecting some variety may be as simple as converting your 800 meter swim into 400 meters of sprinting surrounded by 200 warm-up and cool-down on each end. This also means having a plan as you enter the water. You would never lift weights and simple do the same light weight for 20 minutes and then be done. The value of interval training has been proven, so incorporate it into your swim workouts. Staying in a pool for all of your swims is a bad idea in general, but a big mistake if your races are in open water. Get in the open water do get the feel for the unpredictability of outdoor conditions, learn how to sight, and become comfortable in simulated race conditions. Practicing in the open water is also a great way to become comfortable in your triathlon wetsuit or the other triathlon clothing you plan to wear on race day. There is something about getting in a body of water that has fish and varying depths that just feels different — be sure you get at least a few practices in that are in the open water. Finally, be safe and be sure to swim with a buddy, or at least someone who can easily see you at all times from the shore. Most advanced swimmers swim with some sort of masters swim group. These groups are often early-morning groups that provide for a great workout with people of similar skill levels. A good masters group will cause you to pick up tips from other swimmers and coaches, engage in some friendly competition, all while getting a great swim workout in. In most cities, masters groups can be found at local health clubs, swim centers, or through triathlon clubs. 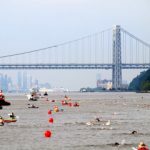 If this was interesting for you but you are really just looking for open water swim information, consider checking out our articles on Open Water Swim Tips. It is based on years of personal experience, and real-life lessons learned from doing dozens of triathlons first-hand.